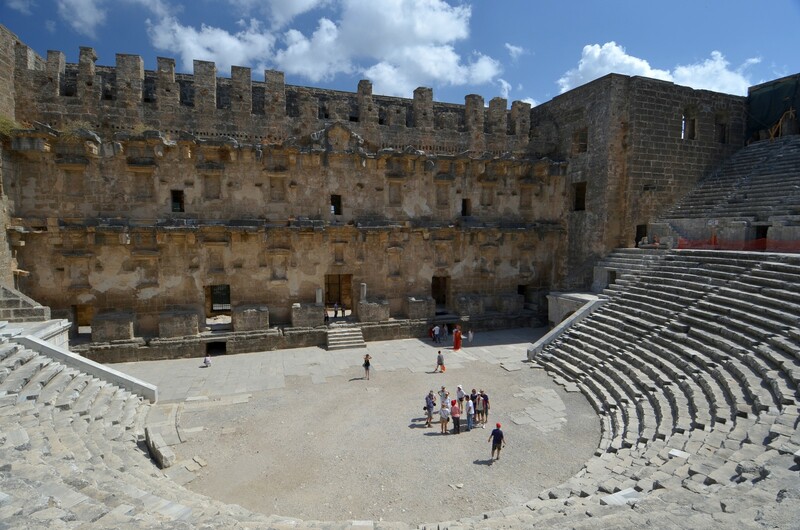 The theatre in Aspendos is considered to be the best-preserved theatre of antiquity. The Roman builders of this structure managed to express the state of ideal balance between the auditorium and the skene building and, what's more, the whole theatre matches perfectly into the landscape. 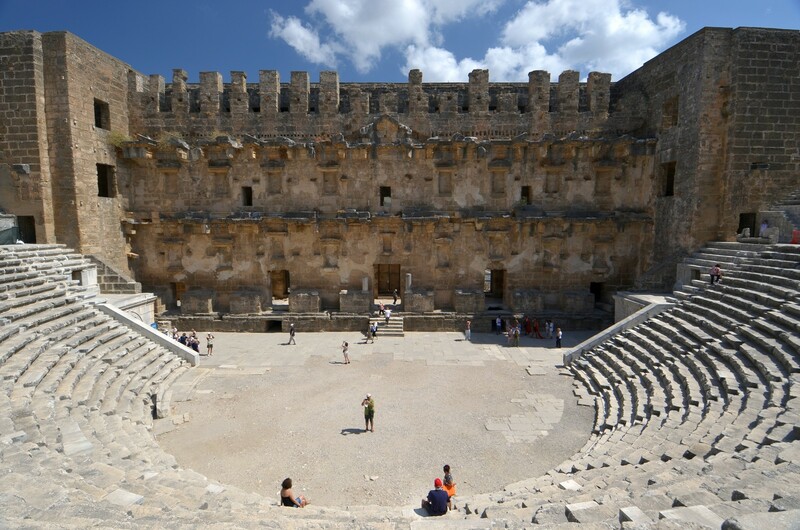 According to a legend, the construction of this theatre resulted from the competition organised by the ruler of Aspendos. The aim of this competition was to build a structure that will contribute most to the city's prosperity, and the winner was to be awarded the daughter of the ruler. Two competitors qualified to the final round. 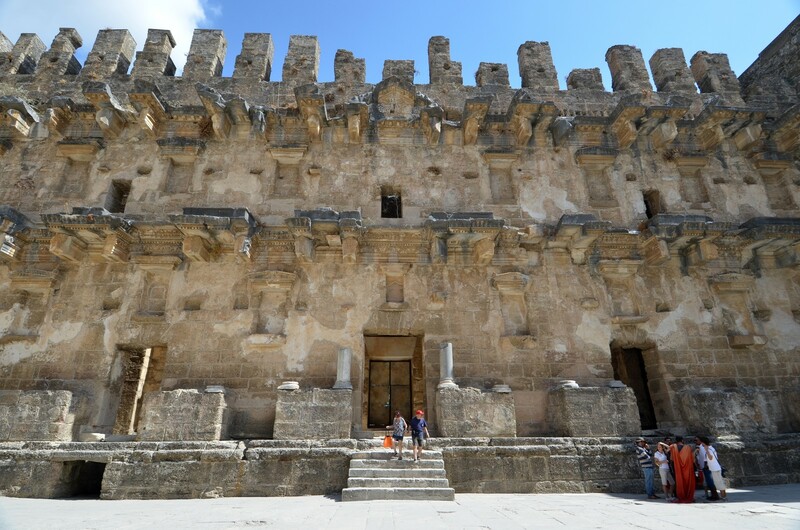 The first of them constructed the system of canals and aqueducts that supplied Aspendos with running water. The ruler was almost convinced to give him the hand of his daughter but decided to visit the theatre, built by the second competitor, for the last time. When he stood on the highest point of the theatre, suddenly a clear voice whispered directly into his ear: 'Your daughter must be mine!' When he looked around in surprise, he saw the builder of the theatre standing on the scene. The theatre's acoustics impressed the ruler so much that he immediately decided in favour of its builder. The wedding took place, naturally, in the theatre itself. 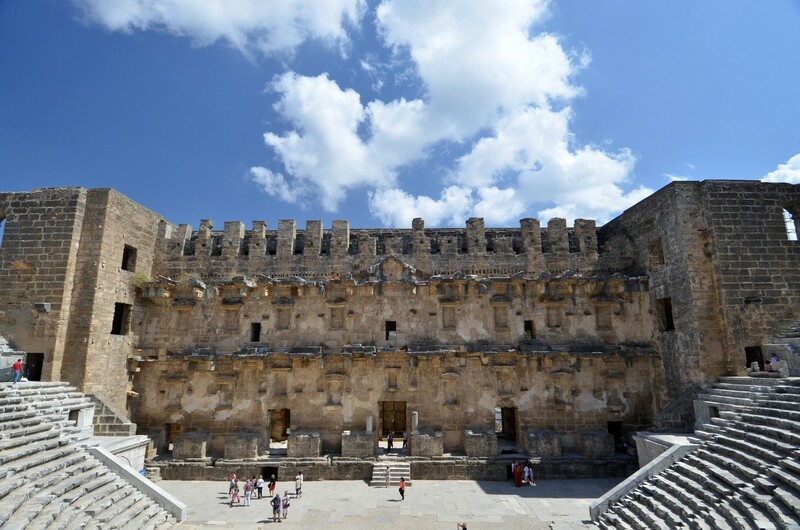 The theatre was actually built in the 2nd century AD, during the reign of the Roman emperor Marcus Aurelius (161-180 AD), on the basis of the project created by Zeno - a Greek architect born in Aspendos. The Greek and Latin inscriptions which are placed above the entrances to the skene building state that two brothers - Curtius Crispinus and Curtius Auspicatus - dedicated this theatre "to the gods of this country and to the Imperial house". 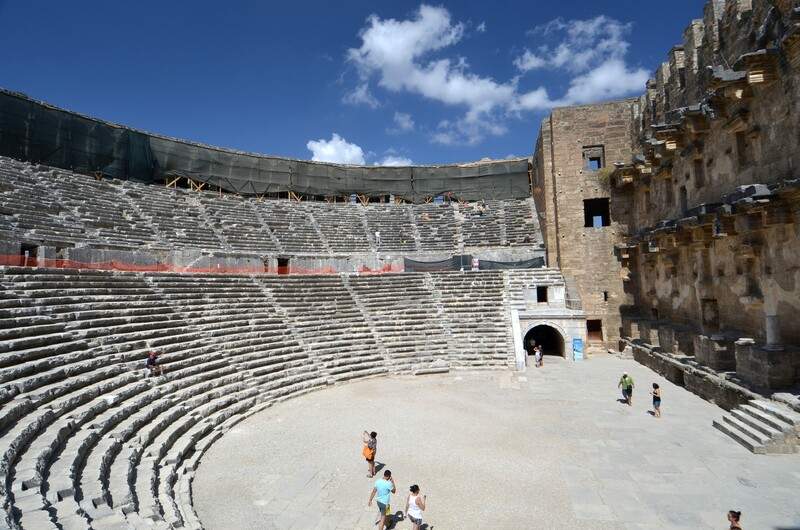 Despite the fact that the theatre was build in the Roman period, the building displays many features typical to Greek theatres. The auditorium rests in part against a hillside. 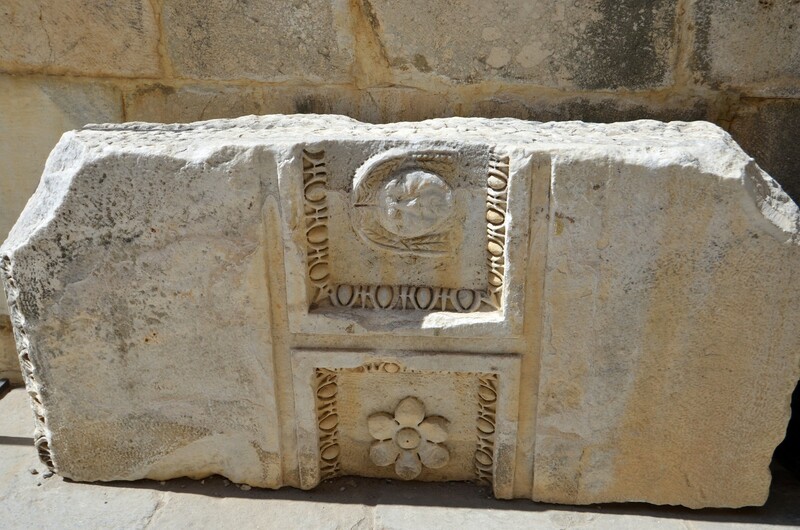 Moreover, a horseshoe shape of the auditorium also is a Greek feature. On the other hand, according to the Roman standards, the theatre is cut off from the outside world by the skene building. Also the barrel-vaulted substructure is a typical Roman idea. 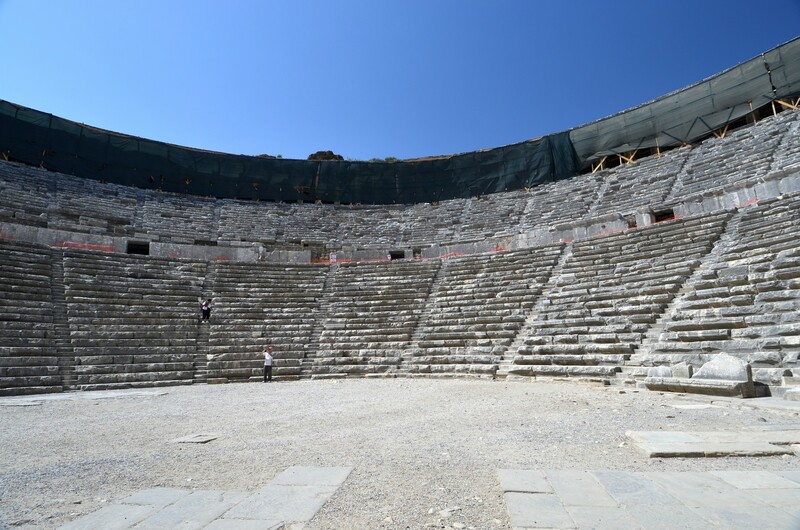 The auditorium of the theatre has a diameter of 96 meters and is divided by a horizontal gangway (diazoma) into an upper and a lower part. It could accommodate up to 7 thousand spectators. An arcade above the auditorium supported by a colonnade used to provide the shade for the spectators when a linen canopy (i.e. velarium) was extended. 58 holes that were used for the montage of the masts are still visible there. The skene building consists of a facade and a proscenium where the play was performed. 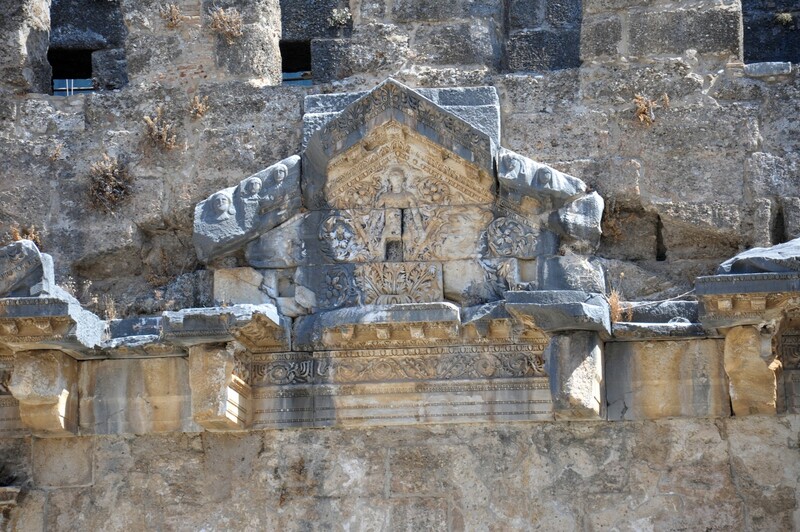 The scaenae frons had five doorways giving entry to the proscenium. The largest gate in the middle was called porta regia and the four smaller ones - portae hospitales. The skene building used to be covered by an 8-meter wide wooden roof. The stage building (skene) was decorated from the inside by a two-tiered facade that still maintains its original height. From the outside the stage building has 17 windows and is visually divided into two levels. 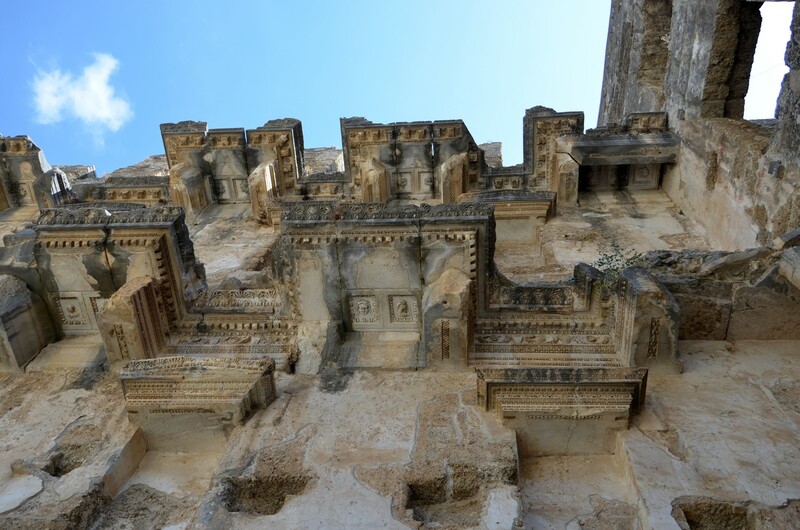 A buttress and a portal that resembles a tower were built in the Seljuq period when the building was used as a summer residence of sultans. In the 30-ties of the 20th century Mustafa Kemal Atatürk visited Aspendos. 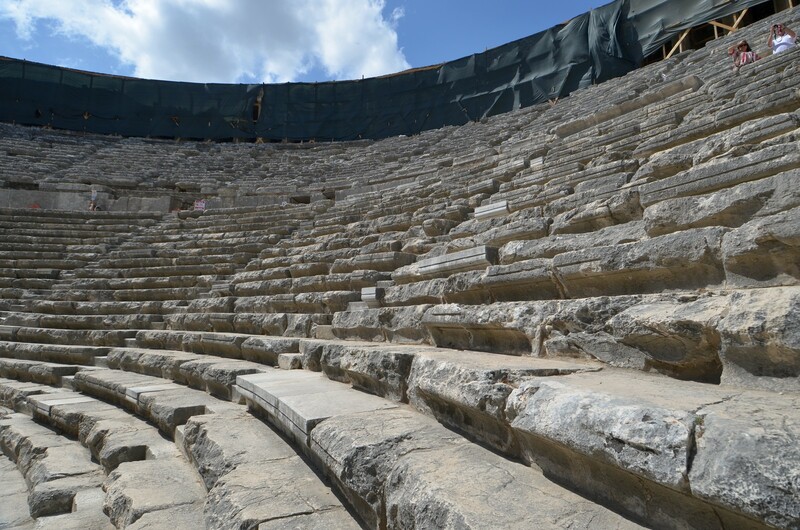 After the inspection of the theatre the first President of the Turkish Republic stated that such a magnificent structure must not be wasted. He order its renovation that stirred many controversies among historians and architects. Since then the theatre is used as a venue for various cultural events, among them - International Ballet and Opera Festival (tr. 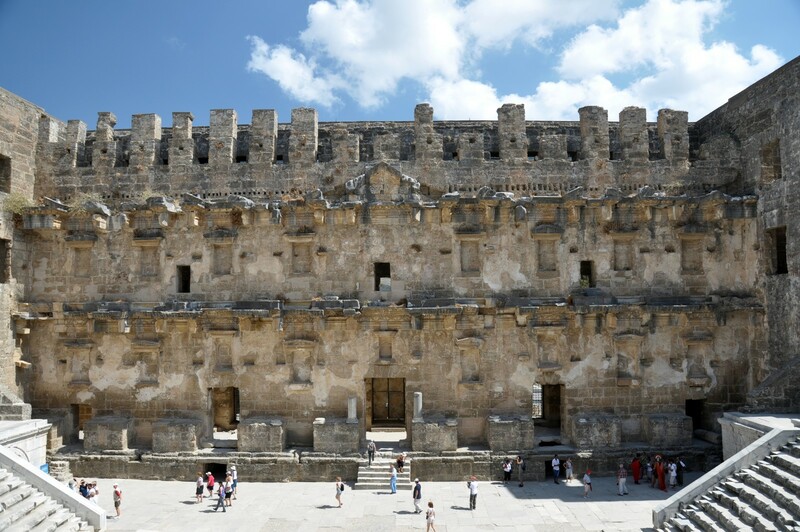 Aspendos Uluslararası Opera ve Bale Festivali). The performances usually take place in late spring and early summer and the tickets are sold out many months before.